City Manager Peter Wallace (left), Financial Planning Director Josie La Vita (centre), and Chief Financial Officer Rob Rossini (right) outline the state of the 2016 budget. I have great respect for Toronto’s public service, but at least one key decision that’s built into the 2016 draft operating budget doesn’t quite meet the transparency standard. It’s not sinister. It’s not nasty or dark or sordid. At worst, it’s nothing more than a politically convenient inconsistency. But it’s a telling one all the same. My problem: the so-called budget gap was reported as $57.4 million, and this doesn’t tell the full story. If you apply the same standards the public service used to draft the budget consistently, Toronto’s actual budget gap is actually $74.8m, at least. If you’re scratching your head on what this means, start with the fact that at the highest levels, budget managers in Canadian civic politics are usually obsessed with two numbers. Unsurprisingly, their biggest fixation is the percentage revenue increase in the residential property tax. This headline-generating number is critical for how voters perceive the budget, regardless of what the actual impact on a homeowner’s taxes might be and regardless what services you’re buying with that number. City councils will stretch, squirm and sneak if necessary to keep that number down; this year, at least one city filed a 1.99 per cent tax increase, just to avoid that two per cent figure. Other cities have struggled to manage that tax headline by splicing up their property tax hikes, even using new names so one part of the tax hike looks different from the other part. The “Scarborough Subway Levy,” city “infrastructure levies” or “the City-Building Levy” all come to mind. Normally, the property tax number is the obsession. But in Toronto in December 2015, since civic leaders decided to show up with an unfinished budget this year, it’s the other number that’s leapt to the foreground instead. It’s the difference between how much revenue the City has already booked into its operating budget if nothing changes, versus how much they expect to spend. This number is known in urban political hack circles simply as “the gap,” because it almost always starts as a giant shortfall between spending desires and revenue realities. If you don’t get the gap down quickly enough over the course of an annual budget cycle, that’s when you need a big property tax number to fill the gap for you. 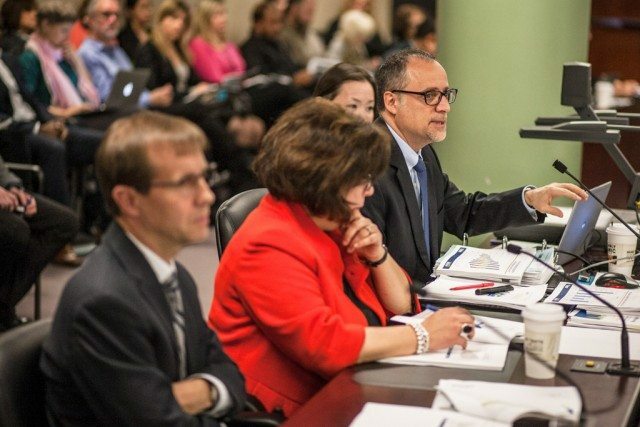 This year, for a few reasons, Toronto’s senior managers brought what would normally be considered an unfinished budget to Council’s Budget Committee. It’s incomplete in two respects. First, the official gap they’ve cited is $57.4 million, so Council must now do the work to close that. This isn’t normal. One possible scenario is that councillors will choose to increase residential property taxes by inflation (pegged at 1.3 per cent) to match the Mayor’s public target, and then find a mix of savings and other revenues to close off the $23 million “residual gap” that would remain. Another possibility is that they just increase residential property tax revenue by 2.17 per cent instead, and walk away. But it’ll be hard to stop there, because of the second change. The second change here is that the draft budget also excludes all but $600,000 in new spending that Council has floated or even endorsed over the last year. You name it: the Poverty Reduction Strategy, parks renewal plans, housing reforms—everything that wasn’t already locked in last year is now out, and even a few things that seemed certain were chucked out too. Wallace’s message is that Council has to find the money if it actually wants those programs to go back in. Every dime of new spending Council agrees to in response to that challenge will, in turn, increase the gap again. These requests could collectively push the gap well north of $100 million, depending on how eager councillors are to act on the city’s competing priorities. From the strict standpoint of financial discipline, this is a responsible approach. It forces City Hall to actually pay for the things it promises, instead of simply announcing them as they did often this year and then hoping they’ll be paid for by osmosis. Peter Wallace and his colleagues are being the consummate public servants, tacitly saying that any decision to increase service levels is a policy choice, and thus Council’s choice. In fact, it wasn’t even tacit: more than once, Wallace insisted that his team’s goal was to file a budget draft that was “policy neutral”—in other words, we’ll do the math, and if you want to add to that math, well, that’s a change in policy. Civil servants execute. Policy is supposed to be a problem for politicians. For Mayor John Tory and his allies, this is also a politically useful choice. The smaller the gap that the managers showed up with the better. The smaller the headline gap, the lower the pressure to aggressively raise taxes or swiftly deliver savings to meet Tory’s targets. Tory’s administration hasn’t prepared the public for either of those outcomes. In contrast, if the budget team had shown up with a larger gap, it would have reinforced the sense that the budget situation was out of control, encouraging councillors to adopt sterner or swifter measures whether the Mayor wanted them or not. On the contrary, there’s been no such action. The first proposed change is $11.9 million in dramatic reductions in rebates for Solid Waste bin users, with the biggest cuts to the rebate falling on extra-large bin users. There may be waste management virtues to this idea (and as a self-described ‘Green Tory,’ I can see several). However, it’s being proposed as a measure to balance the budget, not as part of a larger effort to meet environmental goals, and so it’s hard to believe it’s motivated by green sensibilities alone. And you can’t have a more jarring example of something that isn’t “policy neutral.” After all, as managers themselves admitted, Council approved new garbage rates with those subsidies implicitly built-in literally days ago, in their regular monthly meeting last week. The second new revenue measure is $5.5m worth of cost-recovery fees for transaction costs added to the Municipal Land Transfer Tax. This is over and above the substantial new revenues budgeted in to bet that Toronto’s real estate market surge will maintain its current pace. Strictly speaking, these fees should comply with the Supreme Court’s Eurig Estate test—meaning it’s legally a new fee, not a new tax. The City is perfectly within its legal rights to levy it. But choosing to do so is a noteworthy policy decision, and it isn’t an open-and-shut case. Many councillors are already antsy about assuming that the Land Transfer Tax will continue to be the record-setting cash cow it was this year. Adding $5.5m in expected money that’s contingent on more real estate deals will only increase their anxiety. Collectively, the decision to plug these two ideas straight into the budget gap had the net effect of doing something city financial bureaucracies never like to do. Namely, it made the budget look more balanced and more under control than it actually is, all things being equal. After all, Council can say yes or no to these two proposals just as easily as it could say yes or no to all the new spending that was pushed out for a future decision. Keeping the spending out is policy neutral, but keeping these two other measures in to arrive at the $57.4 million measure is policy-picking by any consistent standard. There are a few likely explanations for this wrinkle. The first is that it’s just a last-minute slip, and slips in the budget pot do happen if the final brew is still percolating. The second possibility is that managers sought to ease the pressure and made a judgment call that these measures would be less controversial than the buffet of new spending proposals now awaiting debate. But the most likely scenario—especially given the Mayor’s recent announcement on garbage bins, and the timing of it—is that in the informal give-and-take that always happens, the Mayor’s Office, or the Budget Chief, influenced the process enough to get one or both of those ideas added to the total count to bring down the gap to a number that had lower shock value. For the record, given my own experience in civic government, I don’t think it’s terrible if that last explanation is the truth. Regardless of who has been in office, the standard line from mayoral critics in Toronto is that the Mayor’s Office should have no real influence on the budget process until the draft is public, and that’s shortsighted. For the public service’s sake as well as the City’s, I believe the opposite: Canadian cities should require some political sign-off—be it from the Mayor, an Executive Committee or a Council Budget Committee—before a budget ever goes public. It should be that way for precisely the reason we’re seeing with this $17.4 million quirk. Budgets are a collection of a thousand little decisions on what to estimate, what to include, what to leave out, what to stage and what to risk, and so on ad infinitum. Anyone who pretends that these decisions aren’t policy decisions or political decisions is simply kidding themselves. Placing responsibility for approving the draft somewhere in the political system before it’s released means someone can be held accountable for the choices and compromises that transform numbers into forward-looking financial policies. And here, we have a nagging example of why that matters. Somewhere, someone in the process made a tiny, artful, inconsistent and seemingly innocuous policy decision to say yes to millions in one kind of decision, even as the budget process was saying no to millions of another similar kind. They made Toronto’s fiscal situation look better than it actually is for 2016 in the process. And that’s great politically, for the short term. But if there’s one thing fiscal conservatives and fiscal progressives in city politics should both agree on by now, it’s that the time for short-term financial wallpaper is over in Toronto. On the other hand, the time for candid long-term thinking and realistic long-term decisions is already long overdue. Brian Kelcey—@stateofthecity on Twitter–is a consultant in city politics and urban strategy. He previously served as budget advisor to the Mayor of Winnipeg, and as a senior political adviser at Queen’s Park.